Atomos Samurai Blade Coming with a 5" Super-Atom IPS Panel, the monitor boasts of a wonderful resolution and an exceptional color accuracy that gives the monitor an image representation just as exact to what your eyes see. It integrates an In-Plane switching technology that unbelievably adds life to images that otherwise appeared dull and lifeless in OLED. The Atomos Samurai Blade 5-inch capacitive touchscreen allows for users to input instructions via gestures and delivers quick and timely responses for a silky smooth experience. This monitor is designed for professional purposes, and this is well addressed by some of the features it incorporates and the tools it supports. Some of these features include an in-built waveform monitor, adjustable gamma as well as high-quality adjustable contrast and brightness. It supports a 325dpi (1280x720) 1 million pixels that guarantee great resolution and color accuracy. When on-site with your Samurai Blade, you can set-up, record or playback shots and this is possible through the use of the full-screen transparent interface. As a user, you can be able to choose colors and exposures that will match well with the shooting space or conditions, and this is possible through the use of RGB, Luma and Vector scope parades which are examples of the full waveform monitor functions. The Atomos Samurai Blade has been designed using aircraft aluminum which is a durable, portable material. For every removable part port, the monitor has been designed with lock mechanisms which ensure that it remains steady and reliable when being used. The Samurai Blade weighs just 380grams making it an ultimate option for studio or outdoor recording. During operation, the AtomOS Samurai Blade consumes just 6 watts of power which makes the monitor more than five times power efficient than its closest competitors. It comes with four power options to ensure a free-flowing recording experience. These include an AC mains power, the AtomOS Continuous Power (dual battery) system, a DC power adapter and the NP series batteries that are supplied with the monitor. The Samurai Blade saves you from the hassles of changing memory cards during shooting by providing you with a 1TB HDD, which can allow up to 60hrs of AVID 36 recording. For high bit-rates including Avid DNxHD and Apple ProRes formats, you can record for up to 5 hours, continuously on a 500GB HDD. When shooting, your worst nightmare could be losing recently recorded files. The good news is that with the Samurai Blade, your files are protected. This is so since AtomOS detects broken files either due to power outages and disc removals and reconstructs their frames to ensure that the files are recoverable within a short time. 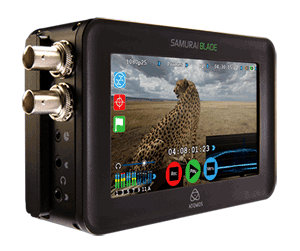 The Atomos Samurai Blade also locks every audio frame (including analog) to a video frame ensuring that the audio remains synced to the video and never drifts. If the audio and video are not in sync, you can rectify this by either delaying or advance audio as it comes in which is quite a smart feature. For reliability and cost-effectiveness, Samurai Blade allows for shoots using 2.5" disks that have better performances when compared to other options such as SSDs, SxS, and P2 as well as SD cards. You can review files that you have created using your Samurai Blade using any PC that has system codec or Quick time installed. The best part is that you can instantly dock, open your cut footage and edit in a 10-bit 4:2:2 with no issues on MPEG degradation, capturing or transcoding. Atomos models offer 3rd party playback support and with your Samurai Blade, you can play any Avid DNxHD or Apple ProRes files using the AtomOS.